... 1906 (105 years ago today), Kathleen Kenyon (left) was born in London, England, the eldest daughter of a father who would become director of the British Museum. Following her graduation in 1929 from Somerville College, Oxford University, Kenyon joined an excavation of ruins, led by the influential archeologist Gertrude Caton-Tomson, in what is now Zimbabwe. On her return to England she continued working, teaching, and publishing in the field of archeology. 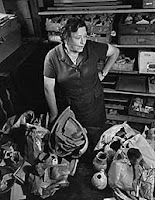 Kenyon became "world famous" in the 1950s, on account of her "[g]round-breaking concerning the Neolithic cultures of the Levant," conducted in the West Bank city of Jericho. (credit for 1969 photo by Jorge Lewinski) In 1973 Kenyon was named a Dame of the Order of the British Empire, equivalent to a knighthood. She died in 1978.